Are you looking for a dessert that is good for Fall? Well I have just the one for you! They are Sour Cream Cranberry Bars. They use dried cranberries. I wasn’t so sure about this recipe at first but after making them and trying one I was hooked. What an amazing taste! This is a fairly easy to make. Just follow the steps in the recipe. That’s all I did since I’d never made it before. I didn’t have regular dried cranberries around so I used Craisins instead. Craisins are very similar to dried cranberries. They are great for snacking but seemed just as good for putting in a dessert too which turned out great with them in it. 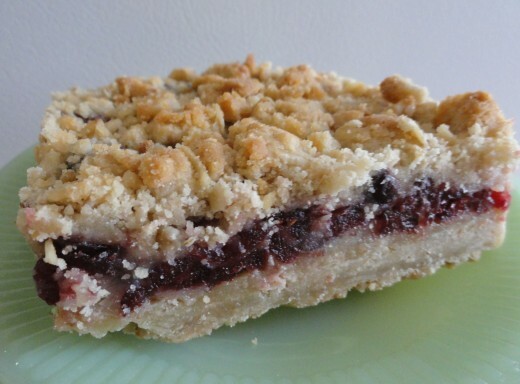 When the bars are done you’ll notice that when you try the bars the cranberry filling flavor is really is good between the buttery crust and the crumbled topping. In a large bowl, cream butter and brown sugar until light and fluffy. Combine oats and 1-1/2 cups flour; add to the creamed mixture until blended. Set aside 1-1/2 cups for topping. Press remaining crumb mixture into an ungreased 13x9-inch baking pan. In a large bowl, combine the cranberries, sour cream, sugar, egg, lemon peel, vanilla and the 2 tbsp of flour. Bake 20-25 minutes or until lightly browned. This clear baking dish is perfect for baking Cranberry bars in. It shows off what the bars look like especially when you put the lid on with the red edging. It highlights the color of the cranberry filling. How perfect is that! If you don’t have regular dried cranberries to use; craisins are great option to use. They are similar to the regular dried ones as you see in these two products. When not in desserts, both are great for snacking on!